Original, quality 1930's moulded glass change slope as used on shop counters for the shopkeeper to place the customer,s change on. 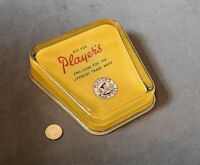 This example is advertising Player's navy cut cigarettes and detailing "Ask for Player's and look for the lifebuoy trade mark". Three small chips to the lower rim to one side, otherwise all is complete and in good order. 6.75" square and 1.75" tall at the back. 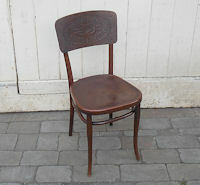 Original, quality 1920's, Bentwood chair for use by customers in a retail shop. This chair is in the original finish and has embossed detail to the backrail "Agent for the Holdfast brand boots and shoes", "EWP and Co trademark" and with a knotted rope logo. The seat panel is also embosssed with a pattern and the underside has retained the original paper label for the maker of the chair Thonet. 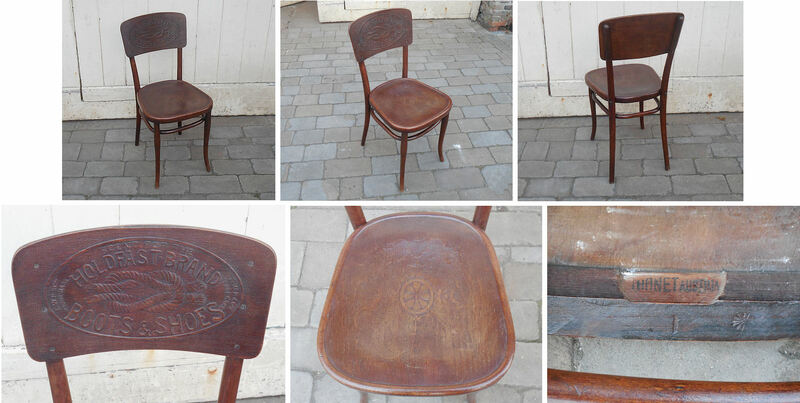 A very hard to find advertising chair, complete and in super condition. 35" tall at back, 19" tall to top of seat, 16" wide + 17.5" front to back. 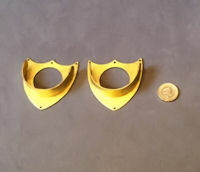 Original, quality pair of unused 1920's shop window brass pole brackets in the original matt gilt finish. Each backplate has three screw holes for mounting and all is complete and in good and working order. Backplate 2" tall x 3" wide and 1" front to back. 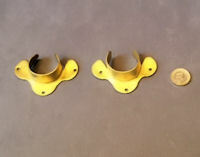 Original, quality pair of unused 1920's shop window brass pole brackets in the original matt gilt finish. Each backplate has four screw holes for mounting and all is complete and in good and working order. Backplate 2.5" tall x 2.5" wide and 0.5" front to back. Price is per pair. Original, quality late 19th Century, large cast brass counter bell. These bells were used on shop or hotel counters and hall tables. The cast pink brass dome is mounted on a shaped central brass column, with a relief decorated cast brass petal shaped base. The externally mounted sprung brass clapper has a cast brass finial, as has the top of the dome bell. All has been polished and lacquered and is complete and in good and working order. Bell dome 4.25", base 4.75" and 6.5" high. 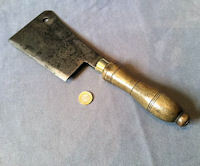 Original, quality 1920's/30's steel hopper from a grocers' electric coffee grinder. These were used to catch the coffee after the beans had been ground through the machine. 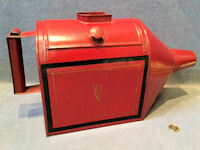 This clean example has retained its original red and black painted finish and is complete and in good and working order. 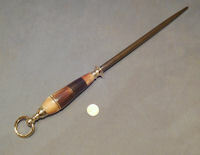 8.5" tall, 16" long and 6" widest. 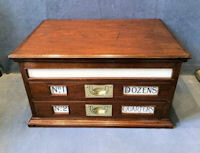 Original, quality late 19th century Haberdashery Shop Counter Cabinet in mahogany with two drawers and a top hinged lid to the third compartment. 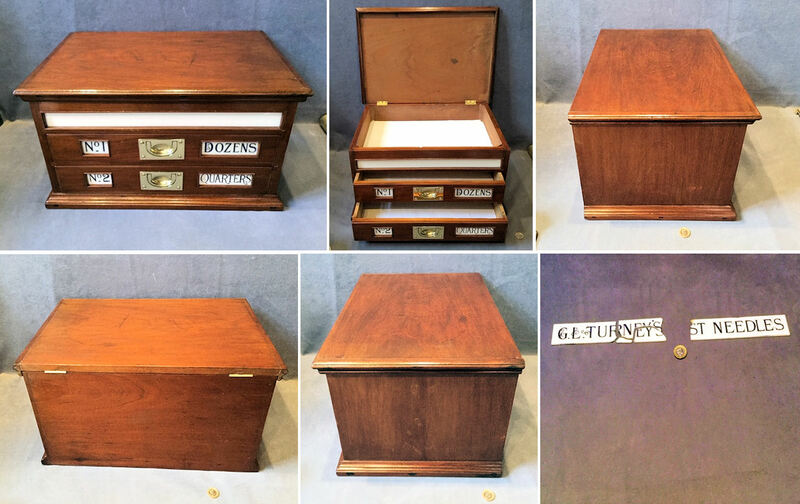 This cabinet was issued to the retailer stocked with G.L Turneys Best Needles. The top white 'Vitrolite' glass label to the upper section has been replaced with a plain panel, the remains of the original acid etched label is included (see picture) and the two drawers have retained the original etched panels and brass recessed pull handle. All has been cleaned and refinished and is complete and in good and working order, otherwise. 19" x 13" and 10.5" tall. 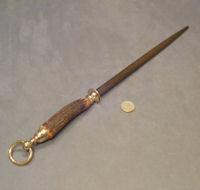 Original, quality 1920's brass huge door pull bar probably from a shop door. This super example has a tubular bar with cast brass cranked supports and finials all mounted on a rectangular shaped sheet brass backplate with sixteen countersunk screw holes for mounting. A wonderful door pull, polished and lacquered, although the lacquer may be removed at no extra cost and complete and in good and working order. Backplate 35.75" x 2.75", total 35.75" x 5.5" and 3.75" front to back. 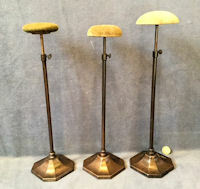 Original, quality circa 1900, shop display hat stands in the original "bronze" finish with an adjustable central stem mounted with material covered blocks. The bases have 'bronze' plated brass covers over a shaped cast iron weighted base with bronze plated stems, which will all polish back to brass if required for no extra cost. Complete and in good and working order. Bases 4" x 4". Tallest down as in picture 15.5". Tallest extended 23.5". Price is for each. 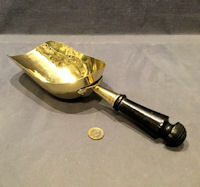 Original, quality late 19th century brass scoop with a turned ebony handle and a fancy cast brass mount. 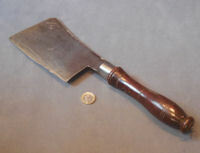 This super example may well have been a coal scoop, or a grocers tea scoop, either or both uses would be ideal. The brass has been polished and lacquered, although the lacquer may be removed at no extra cost and all is complete and in good and working order, 13.5" x 5" x 2.5". 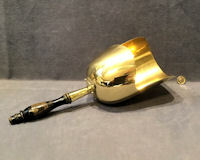 Original, quality late 19th century unused brass coal scoop originally from a shaped brass coal helmet of superb quality. 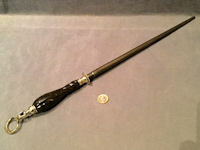 This example has the original turned and ebonised shaped beechwood handle. All is in mint condition with not a dent or blemish in sight and has been polished and lacquered, although the lacquer may be removed at no extra cost. Could also possibly have been a corn chandler's scoop. 16.5" x 5.75" widest x 6" tall. 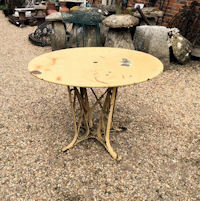 Original, quality 1920's blacksmith made wrought iron table base with the original circular sheet iron top, all in the old off yellow paint but needing a clean and paint, otherwise complete and in good order. 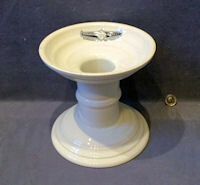 Top diam 39" x 27.5" tall. Spread of feet at floor 27". 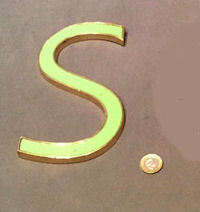 Original, quality 1920's green enamelled on brass shop sign letter of a good heavy weight and in super condition, polished and lacquered, although the lacquer may be removed at no extra cost. Complete and in good order. 8" tall and 3/8" front to back. 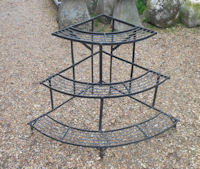 Original, quality pre-war three tier wrought iron corner plant stand, in the old paint. A good sturdy display stand. Complete and in good and working order. 29" tall and 32" front to back. 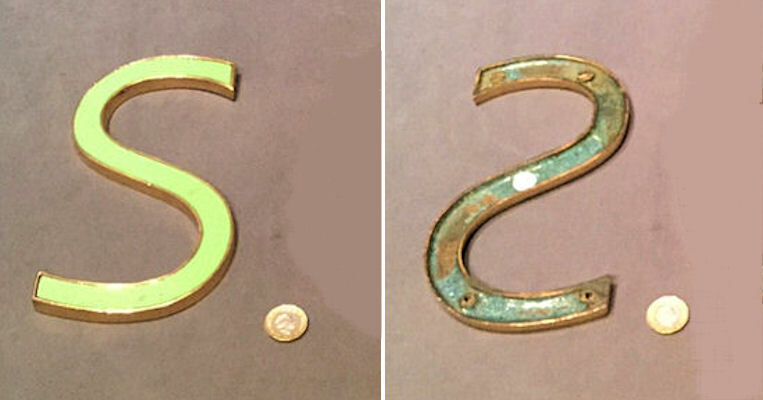 Original, quality, brass plate, with slots for nine different sized coins patented in 1853. This brass plate was fitted onto the shop counter. Its purpose was to test coins for counterfeits, a coin was placed in the relative slot and if correct in weight and size, it depressed the rocker balance below the slot and fell into the drawer below, faulty coins would not go through the slot or stayed in the slot. The slots on this example, each with its own rocker balance, are marked "Sixpence, Fourpence, Threepence, Half Sovereign. Sovereign, Shilling, Florin, Half Crown and Crown". 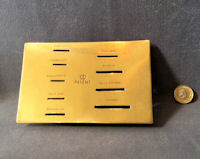 The brass top plate has been polished and lacquered, although the lacquer may be removed at no extra cost. A most unusual coin scale / detector, complete and in good and working order. Brass face 6" x 4" and max 1" tall including mechanism. Original, quality, late 19th century, heavy enamel advertising sign with white text on Royal blue background in two styles of bold upper cased "Wm Ferguson Gas Fitter and Ironmonger". The sign manufacturer is detailed to the lower right corner "Macfarlane Bros. Glasgow". Damage to much of the outer edge with some metal loss as well as enamel but a surprisingly clean and bright gloss to the enamel. A super and early sign with an unusual subject matter. Complete and in good order. 42" x 30". Click on photo for larger larger and other views. 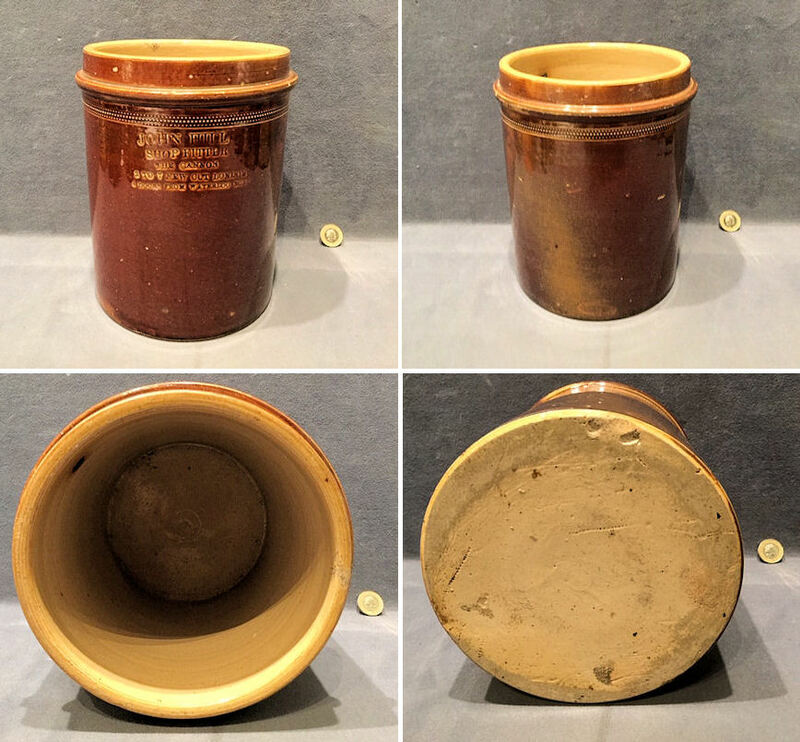 Original, quality late 19th century dark brown glazed tobacconist display jar. Impressed to the front "John Hill Shop fitter, The Cannon, 2 to 7 New Cut London, four doors from Waterloo Road", the reverse is also impressed for the maker "Stiff & Sons Lambeth". 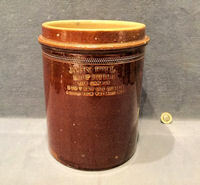 The jar would originally have a black japanned circular tin lid, now long gone, otherwise complete and in good order. 8.5" tall and 6.25" diam. 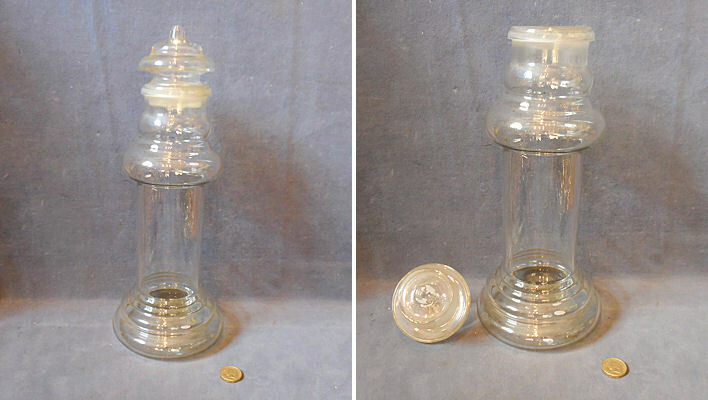 Original, quality 1920's, clear glass confectionery shop sweet jar, with a shaped body and a shaped cap with ground glass collars to both for an airtight fit. Some visible wear to the underside and all is complete and in good and working order. A very usable storage / display jar. 13.5" tall and 5" base diam. 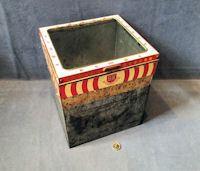 Original, quality pre-war shop display tin for biscuits with a transfer decorated hinged lid with a clear glass panel. The frame of the lid is detailed for "Kemps" biscuits with the logo for 'A Scribbans-Kemp Product". The detail to the lid is in near mint condition and all is complete and in good and working order. Total tin and lid 10.5 tall x 9" x 8.5". Original, quality pair of pre war decorators wooden trestles in the old faded cream paintwork with the original wrought iron hinges. 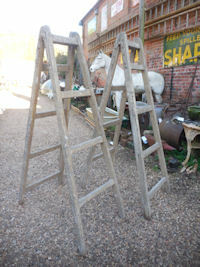 A good sturdy pair of trestles ideal for shop display or as working trestles. Complete and in good and working order. 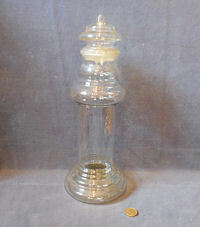 7.5" tall closed, 25" at base 15" at top, 5.5" front to back closed. Price is per pair.